Gabriel & Co., Carizza, Allison-Kaufman, and Studio 311. 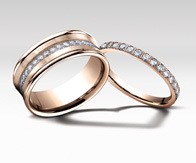 You can choose from a variety of designer wedding sets, and select from several precious metal options. Most designs may be modified for a variety of center stone sizes or cuts. We sell high quality loose diamonds for engagement rings. We can work with you to choose the best diamond to suit the occasion and to meet your budget needs. If you’re looking for bridal party gifts we also carry affordable and unique jewelry items for your mother, bridesmaids, groomsmen, or to wear with your gown on your special day. 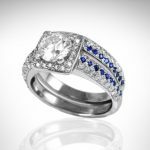 Contact us today to begin designing your wedding set!